Did you know that there are two governor’s mansions in Illinois? Stay at Blessings on State Bed & Breakfast and you can just stroll down the block to tour the only existing governor’s mansion outside the Illinois state capitol. The Governor Duncan Mansion in Jacksonville, Illinois dates back to 1855. It is a beautiful historic home that has been tastefully restored. The current Illinois Governor’s Mansion is the largest of all the U.S. governors’ mansions. It has just undergone a three-year renovation and is now open for tours. It’s located in downtown Springfield, about 40 minutes from Blessings on State. Our governor’s mansion, the Governor Duncan Mansion, is located just down the street from Blessings on State Bed & Breakfast. It is tucked in among other historic homes. The Governor Duncan Mansion in Jacksonville, Illinois was built by Joseph and Elizabeth Duncan in 1834. Joseph Duncan was the fifth elected governor of Illinois, serving from 1834 to 1838. Although the state capitol was in Vandalia at that time, the mansion served as both the official executive mansion and their family residence. Abraham Lincoln served his first term as State Representative under his friend Governor Duncan, and it’s believed that he may have visited their home here in Jacksonville. 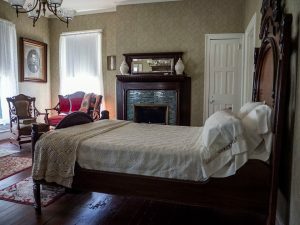 It’s fun for me to imagine that I’m visiting the same historic home Abraham Lincoln may have visited from time to time! Today, the Governor Duncan Mansion, located at 4 Duncan Place, is owned and maintained by the Rev. James Caldwell Chapter NSDAR, with the support of the Governor Duncan Association, a local non-profit. The mansion is on the National Register of Historic Places and it is open for guided tours on Wednesday and Saturday afternoons during the summer and by appointment. The Governor Duncan Mansion in Jacksonville, Illinois is a very interesting historic site to visit. Rooms are arranged to display furniture and the lifestyle of the period. It was said that Mrs. Duncan was so diminutive in stature that the Governor would sometimes lift her up and seat her on the mantel in this historic home! The desk in Governor Duncan’s office was constructed from a piano. 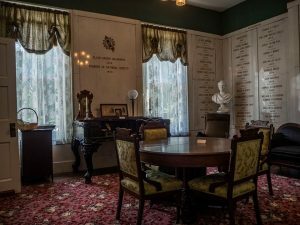 The marble plaques surrounding his office and the foyer list names of those who have contributed to the mansion restoration since 1924 when the DAR took ownership. 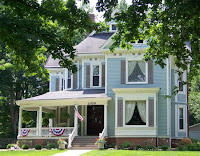 The Governor Duncan Mansion in Jacksonville, Illinois is offered as a venue for special events. 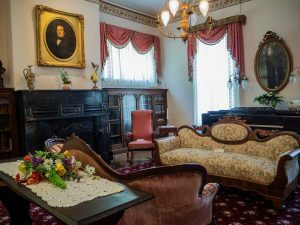 The mansion has undergone many restoration projects to help stabilize the home and promote a more accurate historical representation of the period when the Duncan family resided there. The DAR hosts an annual ice cream social in early August, In addition to weddings, showers and receptions, the mansion has hosted Derby Day, galas and other events. Our guests often walk down to visit the Governor Duncan Mansion and Duncan Park. The mansion is included on the Voices of Jacksonville audio tour, and we’ll be happy to loan you a CD while you’re visiting the B&B. Clint Funk, one of our regular guests, recently enjoyed a private tour of the historic home and shared the photos used in this post. Reserve your suite at Blessings on State Bed & Breakfast and enjoy all that Jacksonville has to offer, right in our historic neighborhood!